What type of films can I find at DAFilms? We have carefully selected the most remarkable documentary films for you; both brand new and time-proven ones made by distinguished as well as aspiring filmmakers. DAFilms legally brings you the best of European and world cinema. 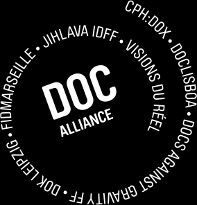 The films are handpicked by DAFilms curators as well as programme selectors of seven significant European documentary film festivals joined in Doc Alliance: CPH:DOX (Denmark), Doclisboa (Portugal), Docs Against Gravity FF (Poland), DOK Leipzig (Germany), FIDMarseille (France), Ji.hlava IDFF (Czech Republic), Visions du Réel (Switzerland). No other VoD portal will give you a more focused look into the contemporary documentary scene with an emphasis on a distinctive authorial approach, socially relevant themes and unique aesthetic style. How much will I pay for films at DAFilms? It is best to get a subscription. Monthly subscription is 6 euro and yearly subscription is 60 euro. If you buy a yearly subscription, you will get 2 months for free. Your subscription is automatically renewed each month/year; you can cancel it in your user profile. As a subscriber, you get access to the entire catalogue and can watch 1700+ films. However, some films from the catalogue have territorial restrictions. You can also download the films for an extra fee. You will pay 2 euro for films up to 30 minutes and 4 euro for films above 30 minutes. As a subscriber, you will pay less for downloads: 1 euro for films up to 30 minutes and 3 euro for films above 30 minutes. Do I have to subscribe to be able to watch the films? The complete catalogue (over 1700 films) is only accessible to subscribers. As a registered user, you will get access to a very little part of the catalogue consisting primarily of student films. You cannot watch the free films without registration. Can I watch the free films? Yes, as a registered user, you will get access to a very little part of the catalogue consisting primarily of student films. Registered users can also use the “pay by share“ option. After registration or sign up, you can watch one film of your choice for free in exchange for sharing it on your social media. What is “pay by share”? Registered users can use the “pay by share“ option. After registration or sign up, you can watch one film of your choice for free in exchange for sharing it on your social media. You can register via a simple form or via your Facebook or Twitter account. What is the difference between streaming and downloading a film? Films are streamed online in your browser while downloaded films will be saved in your computer and you can watch them without an internet connection. How can I play or download a film? After clicking on “Subscribe Now”, you will be asked to register and select the subscription that suits you best. As a subscriber, you will gain access to the entire catalogue available in your territory (over 1700 films) and you can play all the films directly in your browser without any limits. After clicking on “Download Film”, you will be asked to register and pay. After paying, you will be redirected to the film page and the film will be ready for download. A link to the film for later use will be sent to your email address. What are the requirements to play a film? After subscribing, you can watch the film directly in your browser. You don’t need any special software or hardware; if you can play the film trailer, you will have no problem playing the film. You can also watch all films on mobile devices (smartphones, tablets etc.). To play a downloaded film, a regular player in your computer will do. What internet connection do I need to play a film? Your computer or tablet must be connected to the internet to play the film. To watch the film in the best quality possible (1080p), you should be connected to the best line possible and switch the quality in your player to HD. Payments are made through a gateway. You can use your payment card or PayPal. Can I use my credit to pay for my subscription? If you have a credit on your account, you can use it to pay for your subscription in a corresponding amount. Can I use my subscription when travelling? Yes, DAFilms is accessible worldwide. However, some films from the catalogue have territorial restrictions. That is why the film offer may be different in different countries. However, these restrictions only concern 10% of the catalogue at the most. The country in which you subscribe to DAFilms may influence the catalogue offer. Can I give a subscription? Yes. After purchasing a gift subscription, you will get a unique code that will be used by the gift recipient instead of payment. You can send the subscription to the recipient’s email; it will be valid after the code is used. You can cancel your subscription via your PayPal account (if you have paid through this service) or by clicking on your name in the upper menu of your user profile and then on the “Subscription” tab where you will find the “Cancel automatic extending” option. Can I watch the films in HD quality? Yes, we also process the films in HD quality. Some films are also available in Full HD quality. DAFilms always processes the films in formats corresponding to the quality of the source provided by the filmmakers. Can I download the films to my computer? Yes, after clicking on the “Download Film” button, you will be asked to register and pay. After payment, you will be redirected to the film page and the film will be ready for download. A link to the film for later use will be sent to your email address. How do I learn about the language version of the films and the subtitles? The profile of each film contains information about the language version and subtitles. The films can also be filtered according to soundtrack and subtitles through the Advanced Search function. If I encounter any technical problems, who can I contact? In case of technical problems, please, contact our support at support@dafilms.com or at +420 736 538 929.